The ongoing investigation of the National Chairman of the ruling All Progressives Congress, APC, Comrade Adams Oshiomhole over allegations of bribery on the conduct of the just concluded Primaries of the Party ahead of the 2019 general elections by the Department of the State Services, DSS, has been suspended with an immediate effect. Credible sources at the Yellow’s Headquarters of the Service in Abuja and the Presidency told the Nigerian Tribune last night that this followed the intervention of the Presidency to the service to stay clear of the matter which it described as ‘putely internal matter” within the party that should be allowed to be resolved internally by the party itself. ‎DSS had on Sunday, October 29, this year grilled the embattled APC National Chairman for several hours on the allegations of bribery to manipulate the outcome of the party primaries in favour of some aspirants and at a point, it was even alleged that he was advised to tender his resignation which he refused. 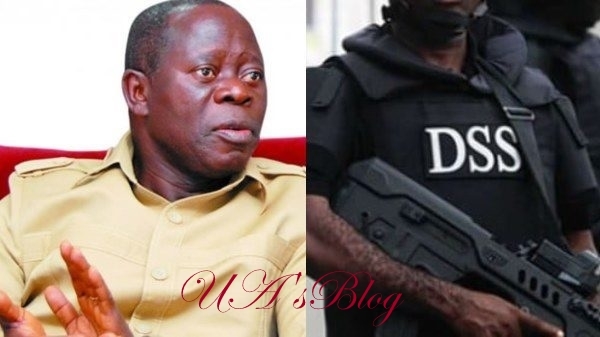 Ujuayalogu'sBlog gathered that with the new position of the DSS on the matter, the APC National Chairman has won the attempts to use the Security to get at him but still have a bigger hurdle to cross ahead of him as the leaders of the Party including the aggrieved APC State Governors are expected to meet with President Muhammadu Buhari to resolve the matter once and for all. ‎A Presidency source confided in the Nigerian Tribune that President Buhari was not disposed to the option of removing Comrade Oshiomhole now that the Presidential electioneering campaign was to take off nation wide and was looking for the ways how to resolve all the issues at the Stake amicably, including the immediate withdrawal of all court cases concrning the primaries from the Court. The source also added that the President was also not disposed to over ruling the Party on the decisions already taken on the primaries of Imo and Ogun States where the two State Governors have vowed to ensure that they have their ways contrary to the decision of the Party.